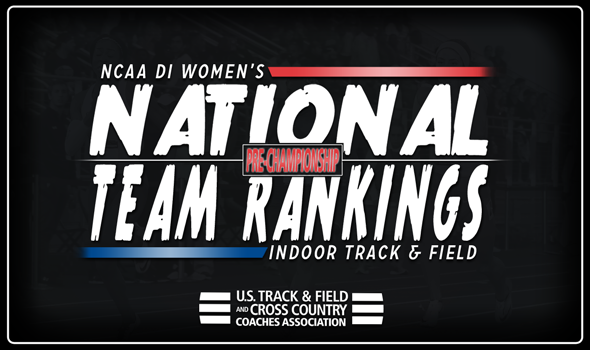 NEW ORLEANS – Participants for the 2018 NCAA Division I Indoor Track & Field Championships have been selected, and the National Team Rankings – announced by the U.S. Track & Field and Cross Country Coaches Association (USTFCCCA) on Sunday – reflect that fact. Even with the rankings being based solely on championship participants, it does not appear that the selections directly affected the top portion of the rankings, as the top-five teams from a week ago managed to stay in their respective spots. Georgia continues to lead the pack in the top-25, as the Bulldogs have 11 entries into the championship meet. The squad from Athens is tied for the most jumps entries with five, led by stars Keturah Orji and Kate Hall, in addition to four sprint/hurdles entries where Lynna Irby will look to continue her stellar freshman campaign. Arkansas sits in second again, despite tying for the most entries with 12. Like Georgia, the Razorbacks have five jumpers that include an NCAA-leading three pole vaulter entrants in Alexis Jacobus, Victoria Hoggard and Desiree Freier. Kentucky sits fifth in terms of entrants at 10, but comes in at third in the rankings thanks in large part to Sydney McLaughlin, Jasmine Camacho-Quinn and Olivia Gruver. The trio lead the 400, 60 hurdles and pole vault, respectively, on the NCAA Division I Descending Order List this season. LSU is ranked fourth once again, and will lean heavily on its sprinters and hurdlers. Tying for the lead with eight entrants in that category, the Tigers’ Mikiah Brisco and Aleia Hobbs sit 1-2 on the 60 Descending Order List this year. The Tigers will have tough competition in the sprints and hurdles, as Southern California – which ranks fifth – also has eight entrants into the championship meet. Dior Hall and Anna Cockrell are second and third, respectively, in the 60 hurdles on the season. The Trojans’ also own the top 4×400 relay team this year. The lone rise in the top-10 of the rankings belonged to Florida, which moved up one spot to sixth. The Gators only have seven entrants into the meet, but have heavy hitters in Yanis David (long jump and triple jump) and a 4×400 relay team that are ranked in the top-five of their respective events. With Florida’s rise, Oregon fell one spot to seventh despite tying for the most entrants into the meet with 12. The Ducks hope to repeat as indoor champs, and have a chance to do so with entrants in nine different events. Rounding out the top-10 is New Mexico, Stanford and Texas A&M. The NCAA Division I Indoor Track & Field Championships begin on Friday at College Station, Texas. The meet will wrap up the following day. Be sure to follow along throughout the week as we get you ready for the championships.